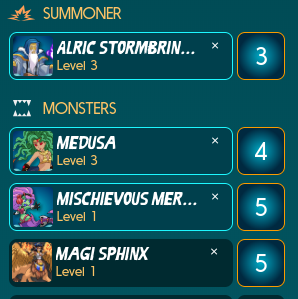 My Steemmonsters decksteemCreated with Sketch. I'm looking to level up and I've got a couple good cards so I'll start testing. Looks good. I'm playing water too. Haunted Spirit from the Death splinter is nearly unbeatable though and with your team of all magical damage, you'll never beat that card or any other Magic Reflect card. Take a look at Naga Warrior or a different Melee or Ranged attacker. Maybe the Turtle or the Soldier, not sure yet. I'd say take the Sphinx out, she's just a worse Mermaid.